It’s been super-windy and rather cold all this last week. After spending some time in the morning listening to the wind howl about the eaves and against the windows, we decided yesterday that soup was definitely in order for dinner. We also wanted to get stuff done, so anything requiring a lot of time was out. Enter the slow cooker. But what to make? You know how I mentioned in Spicy Tortilla Soup that there was a squash blossom soup in the same movie that I wanted to make? We watched a great independent Latino comedy called, “Tortilla Soup” on Netflix Instant. I wish that there were recipes from the show, but alas, I’ve not been able to find any. There was this squash blossom soup, you see, that looked amazing. If I can get blossoms from my farmer this late in the season, I think I’ll try that next. This soup is subtle, spicy and rich. 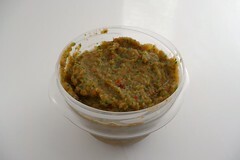 However, if you love fiery foods, you might consider using an additional chile or the whole jalapeno. Also, please note that this depends heavily on how spicy your chiles are. Right now the ones at my market are quite spicy. In honor of feeling generally bad all day and wishing for a good soup I didn’t have to cook or fight with the microwave to defrost, I’ll share with you a recipe I made last week. It’s a take on a classic Greek avgolemono soup with tiny, fluffy meatballs that soak up the deliciousness and explode on your tongue like concentrated stars. The original called for lamb and I agree – ground lamb here would be divine. But it’s expensive and hard to get in my town unless I get lucky with the sales, so I used some leftover ground pork which turned out to be delicious. Often avgolemono soups are not very good reheated the next day but this one was pretty good albeit without the wonderful mouthfeel of the original. I’ve made a mean veggie stock in the past but the problem with it is that we use it up so fast, I’d have to make stock every Sunday just to keep up. This is a great, simple and very flexible bouillon. It tastes wonderful. We used it last night in this creamy egg-lemon soup along with some chicken broth and I swear, it smelled just like the best chicken noodle soup you’ve ever tasted. It doesn’t look like much, does it? However, it’s like having a loaded baked potato in a soup and quite satisfying. We had about 15 pounds of potatoes to use up because it was such a fantastic sale so for the past two weeks, I’ve been using potatoes instead of rice at meals! 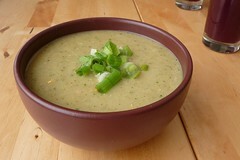 But however you get your spuds, this is a good soup to consider if you have a few extra laying around. 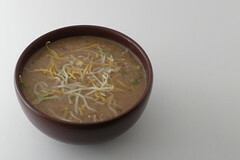 Spring’s here and soon it’ll be too hot to have these kinds of soups, so make it before the weather warms up too much!